Laikyn and I started going to Mommy & Me gymnastics when she was about 10 months old. At first, it was just a reason to get out of the house and let her climb and play! Now, it's turned into actual gymnastics! She can front roll, hang on the bar and walk the balance beam! This past competitive gymnast is proud of her little gym girl! 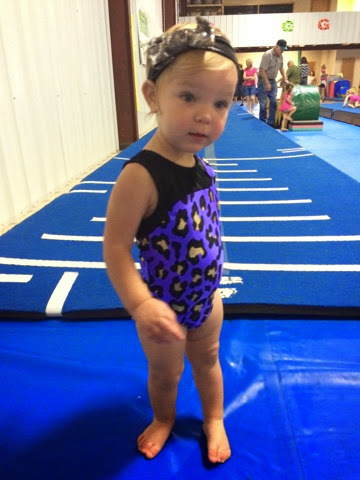 My mom found this tiny adorable leotard online, and I can't wait to get her some more! 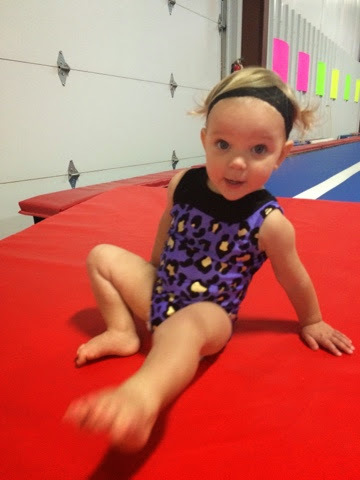 Who doesn't love a baby in a tiny Leo?! Being in the gym brings back so many fond memories of tumbling and flipping around on the bars! I'm even guilty of helping Laikyn do a "kip" on the bars! I remember how long it took me to be able to master it and it's so fun for her to be my little flipping baby doll! Here are some pics from the past few weeks! I am wishing we had other things to do also! I know lots of places offer mommy and me swimming and some even yoga. 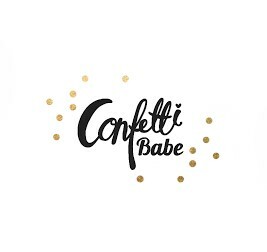 That would be so fun! What do you do for fun with your littles?